Our Christingle Service was as happy a time as ever, a time when we pray for and donate to The Children’s Society, and in return we can collect our beautiful Christingle orange! 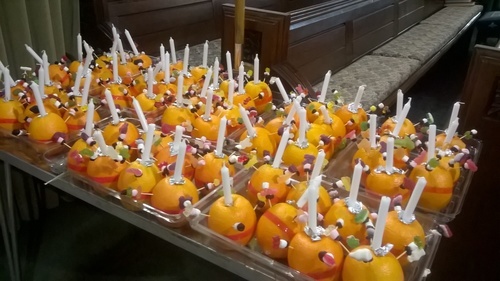 At the Service Revd Anne spoke about the Christingle and asked the children if they could notice ‘mistakes’ made on some of the oranges. The first orange was missing its ribbon, the red ribbon that represents love and the blood of Jesus that encircles the whole world. The second orange was missing the four sticks with sweets that represent how God provides all we need throughout the four seasons, and the third orange was missing its candle, the candle which represents Jesus being the light of the world. At the end of her talk, Revd Anne called some children forward to look at something quite exciting. To the children’s obvious disappointment, it looked like a small box of boring dust! The type of dust that God took and moulded into Adam, but of course this dust was magical! 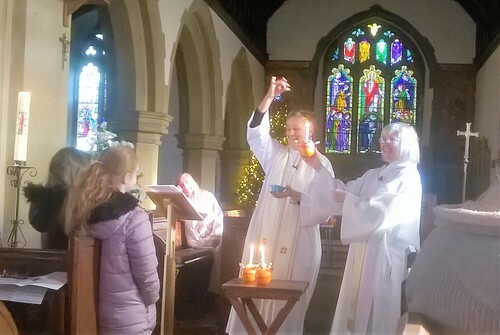 Revd Anne surprised everyone when she took a pinch of the dust and when prinkled over the flame of the Christingle candle made the flame sparkle! How wonderful! 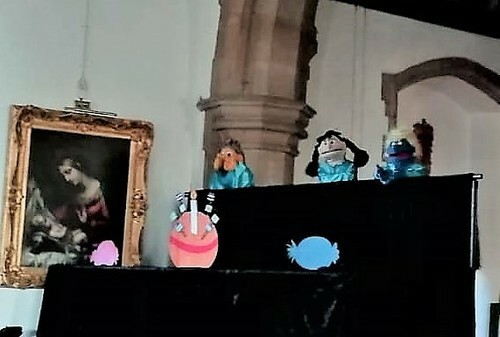 During the service we were delighted to see the puppets who performed the song ‘This little light of mine’. A happy song which brought forth smiles and clapping along with the music. Revd Julie also helped us along with a song called ‘I am a city on a hill’ to which we did all the actions. A very happy service which I am sure was enjoyed by all.